Planning your Alaskan cruise can take a lot of work, and depending on your desired experience and shore excursions, the weather and time of year can have a big impact. But fear not! We created some insider tips to help you get the most out of your visit regardless of the weather along the Inside Passage. Read below for your comprehensive guide and be fully prepared for Ketchikan, Skagway, and Juneau Alaska weather! Quick tip: leave the winter coats at home, but make sure to pack your rain jacket! Click here to explore curated tour packages designed for your trip through the Inside Passage. Ketchikan’s famous creek street is a great place to take cover from the rain in a delightful shop! We will start our weather journey through the inside passage in likely the same way you will start your cruise. As we leave the comparably sunny ports of Seattle and Vancouver, we sail to possibly the rainiest city in America. At the southern end of the Tongass National Rainforest, Ketchikan Alaska weather brings an average annual rainfall of 140-160 inches… you’ll be lucky to catch some sunshine here! This constant rain gives Ketchikan a lush green rainforest and flowing waterfalls year-round. Make sure to check out the rain gauge next to the visitor’s center! It may be wet, but with the right gear, you’ll be plenty warm and happy! We like the saying, “There’s no such thing as bad weather, only bad clothes!” You can be sure that your tour guides will gear you up accordingly for your shore excursions. Just take a look here, at the hilarious get up of the Backcountry Zodiac Expedition. And, don’t forget to ask for your very own set of Pogies (yes that’s their real name) on the Ketchikan Sea Kayak or Orcas Cove Kayak, you will be happy to have them. We always recommend bringing your own raincoats as you pack for Alaska, but know that when necessary, our guides will do everything to ensure you stay warm and dry! If you have any questions, just ask one of our knowledgeable agents about the specific gear provided on tour. And finally, don’t be discouraged from taking to the skies! Though rain is common, there are plenty of clear days in Ketchikan for you to soar through the skies. Ketchikan is one of the best places to experience the wonder of a float plane landing for yourself. Take a trip to the Misty Fjords, that look even more gorgeous as the fog lifts off the mountain tops. Soar over to Neets Bay or Prince of Wales to see how black bears live in the Salmon Capital of the World (hint, fat & happy). Ziplines are great tours for something you can do, rain or shine! The Rainforest Canopy & Zipline Expedition in Ketchikan offers great views no matter the weather. Summer Temperatures: The months of June, July, & August offer average temperatures in the mid-60’s (°F), with the warmest month being July. The ‘shoulder’ season of May & September brings cooler weather in the mid-50’s (°F). The average rainfall for May-August can range from 6.6 – 9.8 inches every month, while September’s average is 13.7 inches! Rain or shine tours: Even with all of this rain, you still have many options for tours that can handle the weather! Enjoy the local flora and fauna with a guided walk through the Wildlife Sanctuary & Eagle Center. Fly through the lush rainforest on the Canopy & Zipline Expedition or hit the backcountry in the fun off-road Adventure Karts. Experience the life of local Ketchikan fishermen with the Wilderness Exploration, or ride on the infamous Aleutian Ballad ship for the Bering Sea Crab Fisherman’s Tour. The low hanging clouds that can often be found in this rainy city make for some wonderful photos! Ah, Juneau. We have left the rainy city and reached our middle ground capital of Alaska that sees less than half the annual precipitation of Ketchikan Alaska weather. The rain is usually more of a drizzle rather than a downpour, but the Juneau Alaska weather changes quickly. You may see sunshine and blue skies and then a heavy cloud cover and rain all within your brief time in Juneau! Don’t be too discouraged if the sun isn’t shining while you’re here… the mist and fog sit beautifully in the trees and surrounding mountains, making you feel as if you’re in an enchanted wonderland. If you’re planning a trip to one of the nearby glaciers you may actually prefer one of the overcast days that Juneau Alaska weather often offers! The cloud cover enhances the appearance of the deep blue ice along the glacier, which makes for stunning pictures. Keep in mind that the glaciers are usually 10-15°F cooler than the temperature in town, so if you’re planning a trip to the glacier you’ll want to add a couple more layers. You don’t need to stress too much about proper footwear for your glacier tours though. Our guides have this gear available for you! The glacier helicopter tours provide overboots so you just need to show up with comfortable walking shoes and your layers. If you have your heart set on going for a snowy sled dog ride on the glacier, keep in mind that the glacier dog camp closes the first week of September (or earlier depending on the Juneau Alaska weather). Helicopter tours are a great way to experience the wonder of Juneau’s glaciers, so long as the weather cooperates! If you’re looking for a more adventurous way to step foot on a glacier, consider the Mendenhall Glacier Paddle & Trek or the Mendenhall Glacier Trek! These tours offer the most time on the glacier and our guides suit you up in a rain jacket, rain pants, and rubber boots (though you’ll need to bring your own hiking boots with good traction for the Glacier Trek). Bonus – these tours rarely get canceled due to Juneau Alaska weather. Summer Temperatures: Juneau Alaska weather remains fairly mild throughout the summer. The shoulder season (May & September) are typically in the mid-50’s°F while June, July, and August are usually low 60’s°F – mid-70’s (°F). On sunny July days, the temperature can reach the high 70’s°F! May-August have an average precipitation of 3.3 – 5.6 inches of rain each month while September’s average is 8.5 inches. Rain or shine tours: Juneau is the place for Whale Watching! The magnificent humpback whales will help you forget about any gloomy Juneau Alaska weather, and if you forgot that extra layer just head inside to the heated enclosed area of the catamaran for warmth. Looking for a sled dog experience that’s guaranteed to run regardless of the Juneau Alaska weather? Take a ride over to Douglas Island for the Sled Dog Discovery and Musher Camp! 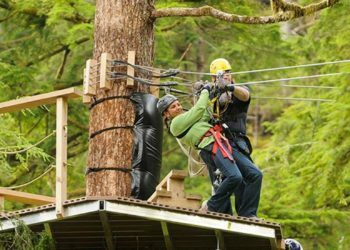 If you’re looking for a more adventurous excursion, consider flying through the trees at the local ski resort on the Alaska Zipline Tour or make a splash on the Mendenhall Glacier River Float. Don’t forget the Gold Panning & Salmon Bake for a fun experience regardless of the Juneau Alaska weather! Even on rainy days, you can still see the famous glaciers of Juneau. The walk out to Nugget Falls from the Glacier visitor center, on the Mendenhall Glacier & Whale Watch combo, is pleasant in almost any weather. You’ve made it to the sunniest of all the Inside Passage ports! Skagway Alaska weather is milder and warmer than any of our other Inside Passage port towns we have traveled through on this journey. As you chat with the locals, they may grumble about “fifties and rain” as their expected Skagway Alaska weather, but this is your chance to tell them how good they have it (I don’t actually recommend doing that, locals can be a touchy sort, just like their famed Brown Bears). Skagway is a tiny town tucked in a valley between big, beautiful mountains. As such, it can be quite windy at times. In a name fitting to Skagway Alaska weather, Skagway is the nickname of Kanagoo, a mythical woman who (according to Tlingit legend) transformed herself into stone at Skagway bay causing strong north winds that create rough seas blowing towards the nearby port of Haines, Alaska. The stone formation for Kanagoo hasn’t been identified, but if asked, many locals will point you to Face Mountain. If you look closely, you may notice that its peaks clearly outline the profile of a face! Can’t stand the wind? Consider taking a break from Skagway Alaska weather on a tour that takes you over to Haines via fast ferry and enjoy the views along the breathtaking Chilkoot Lake! Another option for escaping the wind would be any of our mini-coach bus tours along the Klondike Highway. The White Pass Summit & City Tour, half-day Yukoner, or full-day Yukon Discovery will keep you warm and comfortable in the vehicle as you take in the beautiful sights and make stops along the way for pictures. Skagway is by far the sunniest of all our ports, so spend the day outside! Summer Temperatures: May & September bring temperatures in the mid-50’s (°F) while June, July, and August are usually mid-60’s (°F). Low precipitation of 1-2 inches for May-August with September averages of 4.3 inches. On average, the warmest summer month is July. Rain or shine tours: We have many popular tours that don’t risk being canceled due to Skagway Alaska weather! Hang out with the dogs on the Sled Dog & Musher’s Camp or zip around the forest over waterfalls on the Grizzly Falls Zipline. Venture away from the crowds on the Glacier 4×4 Adventure or try your hand at glassblowing! Fear not! Cloudy weather actually can make for better pictures, so keep your cameras at the ready. Summertime in Alaska is absolutely stunning, regardless of rain or overcast skies! Now that you know what to expect for Ketchikan, Juneau, and Skagway Alaska weather, let’s cover what to pack. Wearing the right clothing will make a world of difference. Layering is key since the weather can change quickly, and we recommend the following for a perfect setup: base layer t-shirt (we suggest synthetic or wool, not cotton! ), mid-layer (fleece), and an outer-layer (waterproof jacket or shell). If you tend to get cold, make your mid-layer a bit warmer, or add a vest! Finally, a light hat and gloves will keep you cozy in the wind, and don’t forget good walking shoes. The most important thing to remember about weather in Alaska is that it is always changing! So wear your layers, and be ready for the clouds to roll in. Even if the Ketchikan, Juneau, or Skagway Alaska weather is not ideal, you will be blessed with plenty of daylight! In the beginning of Summer in southeast Alaska, the sun rises around 4:30 AM and sets around 9:30 PM. By mid-August, the sun rises around 5:30 AM and sets around 8:30 PM. The longest day of the year in southeast Alaska is June 21st with 18 hours and 18 minutes! Congratulations, you are now fully prepared to enjoy your visit regardless of the Ketchikan, Juneau, and Skagway Alaska weather conditions! Many of our guides provide gear, but don’t hesitate to reach out with any questions about what to bring beforehand! By following this guide and wearing the appropriate clothing, you’ll ensure a (mostly) dry and happy visit along the Inside Passage. We’ll see you up here!